VERA WANG dress top comes in black cotton with a pointed collar, ruffled grosgrain ribbon applique front, and lace sleeves with pleated panels and long cuffs. Made in USA. Excellent Pre-Owned Condition. Marked: 6 Measurements: Shoulder: 14 in. Bust: 38 in. Sleeve: 28.5 in. Length: 26 in. 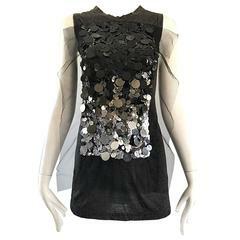 Vera Wang Collection Sleeveless Top with Tiered Fur Front with Patterned Silk Lining and Sheer Back. Available in Sizes 0 through 6!